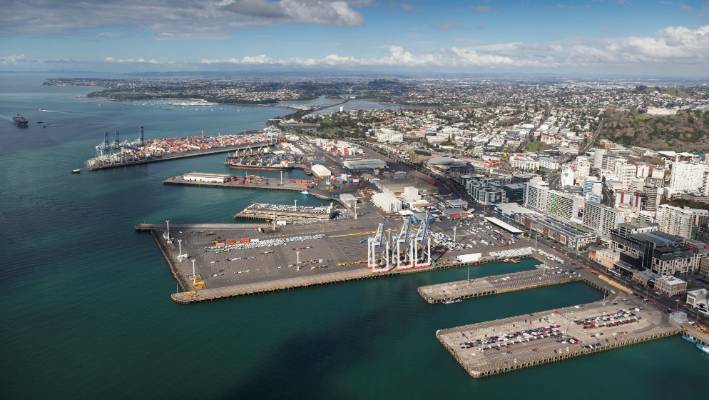 OPINION: The future of Auckland’s downtown port deserves careful and unemotive consideration – the problem is, it will become entangled in two elections in the next two years. The big question is, should all or part of Ports of Auckland’s current operations go elsewhere, either to existing upper North Island ports, or to a brand new port? Before the 2017 general election New Zealand First pledged to move the whole thing to Northland by 2027 – with the vehicle import trade gone this year. A working group led by former Far North mayor Wayne Brown has finished an interim report after canvassing the views of major stakeholders on the futures of the three major upper North Island ports, but it has yet to go to cabinet, and is described as “non-decision-making.”. A more substantial “final” report from the group is expected in September, a month before local body elections. That is expected to be only the end of the beginning of the debate, signalling the investigations needed if the idea is to be pursued. Those who were at an early meeting involving Brown and Auckland mayor Phil Goff, described the tone as “interesting”, and the pair clashed publicly even before that meeting. Goff is navigating a tricky political path, having himself campaigned in 2016 on moving the car trade, and eventually the port, but now having to defend the interests of ratepayers who own Ports of Auckland through the council. The mayor has quickly filed away a report he commissioned in 2017, hoped to show the economic argument for shifting the vehicle trade out of Auckland. The report by NZIER in fact found the gain of reclaiming part of the waterfront to be $115 million, but the net cost of losing the trade to be around $1 billion. If the Brown group report is delivered in the run-up to the local body elections it risks fuelling political posturing on an issue needing no urgent decisions. Ports of Auckland is working to ensure it can do its job for another 30-40 years within its existing footprint, and even then no one knows what new technology, or trade patterns might extend that. Automation of the container terminal alone will nearly double the capacity it has today. Ugly though the port might be, it directly employs about 500 staff, pays $68m in wages, and chips a $51m annual profit into council coffers. In short, it may never have to move, but there are arguments in favour of it doing so, and releasing prime waterfront land for more public enjoyment. Any huffing and puffing this year over the port might pale against what could happen next year, as the parties in the coalition government return to their individual stances in the run-up to the general election. NZ First will want to show progress on its 2017 pledge, with both leader Winston Peters and list MP Shane Jones – who oversees the port work – wanting to keep faith with their Northland supporters. Labour’s influence in the cautiously worded work now underway suggests less enthusiasm for a rush to undertake the biggest infrastructure project the country has ever seen, in relocating all or part of a port, with the roading and rail links needed. Of all the policies the NZ First Party brought into this coalition Government, the wildest and wackiest was to move the entire port of Auckland to Marsden Pt. The Labour Party agreed only to commission a feasibility study the idea of moving the port and left open the choice of alternative sites. Winston Peters, hoping to hold the Northland seat, promised to move the whole operation to Northport, but the coalition agreement merely directed Northport be given “serious consideration”. The feasibility study led by former Far North District mayor Wayne Brown is reported to have produced an interim report for the Government and its tentative suggestions ought to be interesting. The fact that ministers will receive at the same time a report on upgrading the railway from Auckland the Marsden Pt suggests Northport is the preferred alternative for at least some of Auckland’s imports. Doubtless there are countless ways that goods shipped to or from New Zealand could be better shared between various ports, not only for more efficient handling and distribution but also to stop the Auckland port encroaching ever further on the Waitematā harbour. Doubtless too, the companies running ports would quickly find a more efficient use of them — within the constraints on Auckland — if Ports of Auckland Ltd had commercial shareholders. Its nearest rivals, Port of Tauranga and Northport, are majority owned by their local bodies but also have tradeable shares which has resulted in a degree of cross-ownership. Tauranga has a stake in Northport, as does Ports of Auckland Ltd. But PoAL is entirely owned by the Auckland Council which has been averse to any of its business going to other ports. Total public ownership has been a mixed blessing for Auckland citizens. While the council collects all the port’s dividends it suffers a conflict of interest when Aucklanders oppose the port’s further expansion. Despite a long campaign to stop the port company extending wharves for the latest cruise ships, the council is allowing moored “dolphins” and walkways to extend Queens Wharf. Mayor Phil Goff did not exactly welcome news this week that an interim report of the feasibility study has arrived on ministers’ desks. “Any decisions on the future of Ports of Auckland should have the agreement of the council,” he said. “We accept that at some point the growth of freight into Auckland will outgrow the land available…..” Citizens opposed to further harbour reclamation would say that point was reached some time ago. Goff said the same when he stood for election. “However, the port is also a critical lifeline of freight into our city,” he says now. No it is not. Freight from any other port could reach Auckland, making room for cruise ships within Auckland port’s existing harbour footprint. Most of Auckland’s port is unlikely to be going anywhere. The feasibility study should be looking at rationalising the use of all New Zealand Ports but it should not suppose politicians can best decide where freight goes. The Hawke’s Bay Regional Council is planning to partially float its port at Napier. If the Auckland Council did likewise it would see the city’s interests more clearly. The Government has launched a new independent Crown entity tasked with addressing New Zealand’s “unprecedented infrastructure deficit”. The New Zealand Infrastructure Commission – Te Waihanga – would look at ways of fixing and further funding areas where infrastructure investment is needed. Transport projects and urban infrastructure issues would likely be the focus of the new commission. Infrastructure Minister Shane Jones said New Zealand has an “unprecedented infrastructure deficit” and the commission was tasked with addressing that. He said New Zealand’s transport and urban infrastructure was struggling to keep up with population growth. “That’s simply not good enough,” he said. The Treasury has estimated the total infrastructure spend over the next five years would be $42 billion – more than double that of the past five years. Jones said this showed why the establishment of the Infrastructure Commission was needed. Overall strategy and planning would be the focus of the new body. In a Cabinet paper, Jones said the Infrastructure Commission would also act as a “shop front” for private companies looking to invest in New Zealand. He pointed the finger at the previous Government, accusing National of focusing on short-term projects and under-investing in infrastructure projects. Local Government New Zealand president Dave Cull said unprecedented population growth and the need to adapt for climate change, as well as a low-emissions economy, means that New Zealand was “behind the eight ball in terms of infrastructure investment”. “Having a central agency to act as a shop front that the private sector can interact with, and having an ability to buy goods and services in bulk will be a massive benefit to regional development projects,” he said. The Cabinet has approved just over $4 million to establish the commission and legislation establishing the body would go before Parliament in April. The creation of the Infrastructure Commission has been well flagged – in August last year Jones announced work had begun on establishing the body. He said Treasury had been unable to properly quantify the value of the infrastructure deficit New Zealand was facing which he said “was not good enough”. The new body would work to quantify the level of the deficit, as well as figuring out how to fix it. The Government received 130 submissions on what the body should look like. “It will help hold this Government, and future governments, to account and we welcome that,” Jones said. In the high-tech equivalent of “look Mum, no hands,” Ports of Auckland’s new 70-tonne straddle carriers will hurtle around at up to 22km/h, without anyone at the controls. This Luddite’s nightmare means no human contact with the container from the time the truck driver unscrews his twist locks to just before it is hoisted by crane and deposited on a ship. For imports, it will be the same process, only in reverse. As the port sees it, public opinion is against expansion through further reclamation, so the only way to improve productivity is through technology. The system is now being tested, with empty containers stacked high to act as a barrier in case something goes wrong. And something going wrong doesn’t really bear thinking about: fully laden, the port’s new carriers weigh in at 100 tonnes – not easy to stop in a hurry. When the project is complete, the port’s 27 new blue carriers will be involved in an elaborate dance to get containers on and off ships, with the process controlled by software at head office. “It feels funny when you see this giant machine coming straight towards you,” says the port’s automation project manager, Ross Clarke. The Auckland Council-owned port is under pressure from New Zealand First to relocate to Whangārei, and the Government is conducting a comprehensive upper North Island logistics and freight review to ensure New Zealand’s supply chain is fit for purpose in the longer term. The review will guide the development and delivery of a freight and logistics strategy for the upper North Island. This includes a feasibility study to explore moving the location of Ports of Auckland, with consideration to be given to Northport. 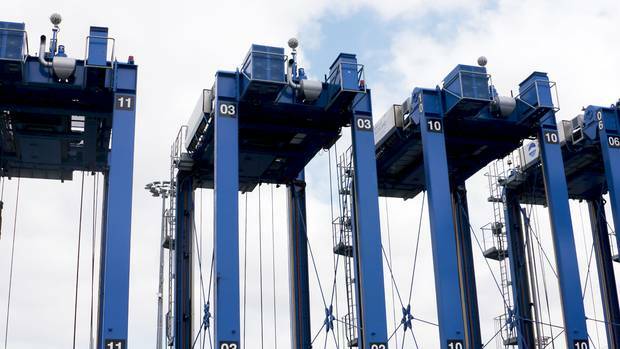 Clarke says the new straddle carrier technology, alongside the port’s three new cranes that arrived last year from China, is seen as a game changer.Can we resuscitate our struggling sharemarket? Automation will increase its terminal capacity from just over 900,000 TEU (20-foot equivalent units) a year to 1.6-1.7 million, the port says. 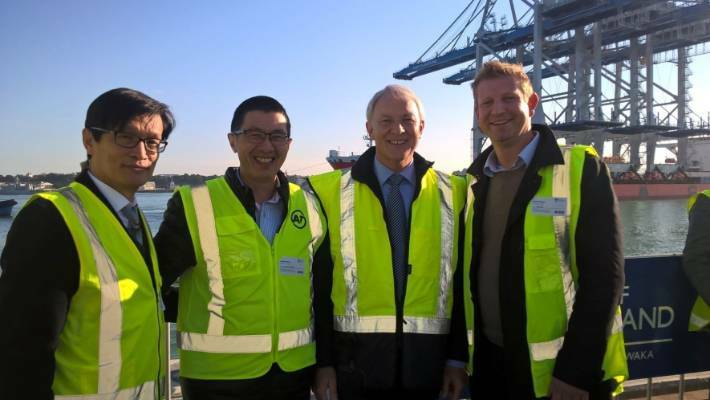 Auckland will be the first New Zealand port to partially automate its container terminal. At the same time, the port says the straddle carriers will save as much as 10 per cent on fuel use. There should also be less impact on neighbouring communities as they will require less light and will not make as much noise as conventional, manned carriers. The new Konecrane carriers will deliver more capacity because they can stack four containers compared to just three for the existing carriers. This, combined with changes to the terminal layout and past reclamation work, is expected to increase capacity by 80 per cent. They come with a positioning system called Locator – a type of ground-based GPS that boasts an accuracy of plus or minus 3cm. Clarke says that given its constrained area, something had to be done to grow the port. “If we didn’t do something to increase that capacity then the business’s throughput, and therefore revenue and profit, would be capped. “We can’t expand the footprint of the terminal – the public have been clear about that,” he says. “Dwell times” – the time it takes for exports inside terminal gates to be loaded onto a ship and imports onto a truck or train – are already low by world standards. Automation means stevedoring roles will go, but Clarke says the number of jobs lost is likely to be less than the original estimate of 50. “The chances are that with the new cranes, and the increased throughput, the reduction in jobs might not be that much at all,” he says. Clarke says the port has trouble recruiting enough staff to deal with current demand, and there are vacancies it can’t fill. 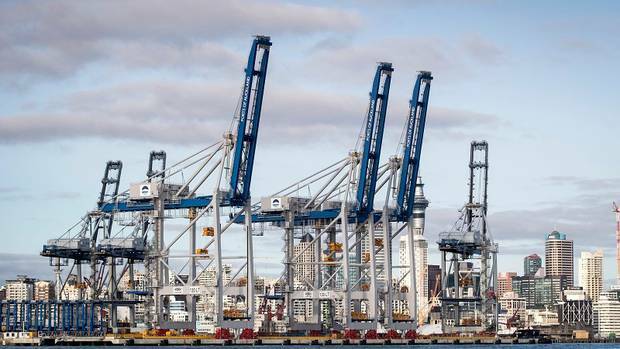 The high-tech carriers will initially work with the port’s new, $60 million, 82.3m high cranes which weigh in at 2100 tonnes apiece, against 1200 and 1300 tonnes for the older cranes. The port says that with these new cranes, and the new deepwater berth they will sit alongside, the port will be able to handle the biggest ships coming to these shores. They can lift four containers at once, weighing up to 130 tonnes combined, a New Zealand first. The current cranes can lift two containers, weighing up to 65 tonnes. The new cranes can service ships carrying more than 11,000 TEU, which the port expects will offer some “future-proofing” against increases in the size of ships. Ports of Auckland is only the second port in the world to automate as a “brownfields” development – most automated ports are built from scratch. Clarke says maintaining the port’s day-to-day operations while the project is underway has been a big challenge. 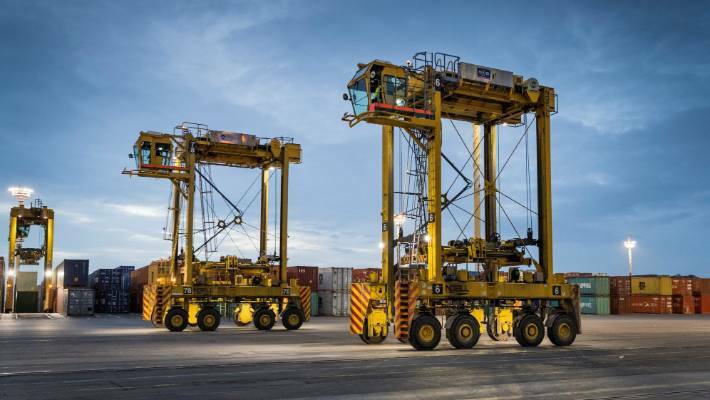 Initially the northern third of the terminal – where the new cranes are – will be automated while the southern part will continue with manned straddle carriers. Once it is satisfied that the technology is working to plan, the port company will complete the rollout for the rest of the terminal. The first stage goes live in February next year, followed by the second stage in April. Clarke says that by the middle of 2020, the port should have a fully operational automated container terminal. Works have started on one of the worst accident black spots on State Highway One. Starting tonight, contractors will be felling trees and removing vegetation in the Dome Valley, north of Auckland. New Zealand Transport Agency (NZTA) said crews would be working overnight from 7pm to 6am, to minimise traffic disruption. The job will take about two weeks. The work will clear the way for major safety improvements along a 15km stretch from Wellsford to north of Warkworth, and includes widening, right-hand turning bays and flexible road safety barriers. The winding road through the Dome Valley is notorious for crashes. NZTA is advising motorists travelling between Northland and Auckland to plan ahead and allow extra time for their journeys. An artist’s impression of the original East-West Link planned by the previous National government. Auckland’s much maligned East-West Link (EWL) motorway project is back on the table according to the New Zealand Transport Agency (NZTA) which is currently re-evaluating it. The EWL project was first unveiled in 2014 by the then National-led government which said it was a way to link SH20 at Onehunga to SH1 at Sylvia Park Mount Wellington. The planned four lane highway, which was earmarked as a priority roading project, was expected to cost up to $1.85 billion. But after a change of government the new Labour-led administration announced in November 2017 that it was scrapping it. It had fallen down the pecking order of Auckland infrastructure projects and Transport Minister Phil Twyford instead redirected a lot of the government’s funding towards public transport. However, in April last year Twyford did a u-turn on the controversial motorway project and announced that a new low cost version of the EWL would be looked at as part of the Auckland Transport Alignment Project (ATAP) and earmarked $800 million dollars for the new proposal. So now almost a year later where are things at? An NZTA spokesperson now says East-West Link is one of a number of projects currently under review by the agency as it looks to see whether it still aligns with its “new vison” for Auckland’s transport network. The NZTA announced in January last year that it had been granted resource consent to proceed with the project. But it said that the consents were enabling and not obligatory. In other words the project can go ahead if and when government funding is secured. A spokesperson for the Transport Minister Phil Twyford says the government is looking at a lower cost version of the EWL and is hoping to make an announcement on it in the next few months. But no further details are available at this stage. National Party transport spokesman Paul Goldsmith says the government’s latest proposal isn’t good enough. But the grand proposal put forward by National before the last election wasn’t cheap. According to Infrastructure New Zealand the proposed EWL would have cost $327 million per kilometre, something its critics were keen to highlight. With some even describing it as the most expensive roading project in the world. “It’s an enormous amount of money on a very short link of dubious value that does a great deal of destruction to the natural environment,” Greater Auckland author Patrick Reynolds said. But despite the massive cost of the National Party proposal, Infrastructure New Zealand chief executive Stephen Selwood said it was an important project. Infrastructure New Zealand is a lobby group which represents both public and private sector organisations with the goal of facilitating the growth of New Zealand’s infrastructure and influencing central, regional and local government decision making. KiwiRail says it is pleased with work undertaken to date on a potential extension of its rail network to Northport at Marsden Point. The firm began geotechnical work in late October on a route for a 20-kilometre spur line from Oakleigh, running east toward Marsden Point. The final drilling was completed today and further exploration work will continue this year, acting chief executive Todd Moyle said in a statement. “Our investigations have focused on areas where the most significant engineering works would be needed,” he said. Deputy Prime Minister Winston Peters and Regional Economic Development Minister Shane Jones visited the drilling site today. New Zealand First has driven an investigation into the feasibility of relocating Ports of Auckland to Northport. That is being considered by a five-member working group tasked with developing a broader strategy to better integrate transport logistics chains in the upper North Island. The cost of the new spur line was estimated at $100 million a decade ago. Bringing the Auckland to Northland line up to standard to handle major freight volumes has previously been estimated at more than $2 billion. Jones, a list MP, lives in Northland and is a fan of rail. Tourism and freight projects of state-owned KiwiRail have so far received close to $90 million from the Provincial Growth Fund he oversees, including funding for the Northland spur study. KiwiRail chair Greg Miller says significant agricultural and horticultural investment going into Northland will require an efficient supply chain. The Provincial Growth Fund will allow a renewal of regional rail and there is a growing acceptance of the wider benefits rail brings by taking trucks off roads, reducing road maintenance costs and improving road safety, he says. An aerial view of Ports of Auckland from the west. A rift has opened up between Auckland Council and the Government over how the future of the city’s port will be decided. Mayor Phil Goff says there’s a risk that a Government-appointed working group looking at the upper North Island ports might have pre-determined whether Auckland’s council-owned port could move, and if so where. Goff said he put a “robust” view to the working group’s chair, former Far North mayor Wayne Brown, in a private meeting last week. He said Brown’s public rejection of two potential locations identified by a council study didn’t give confidence, and the group didn’t appear to have enough time or resources to do a proper job. The council on Tuesday approved a blunt letter to be sent to Brown, ahead of the council’s first formal meeting with the working group in just over a fortnight. Goff favoured the eventual shift of the port from its current location on the downtown waterfront, but was unhappy with the approach being taken by the working group. The council will tell the group that its priorities include protecting the value of Ports of Auckland, which last year paid it a $51.1 million dividend. It is also telling the working group it wants a transparent, objective and evidence-based approach to reviewing the future of the ports in Auckland, Tauranga and Whangarei. Auckland Council has conducted the most detailed work so far on the future of its port. Previous mayor Len Brown funded out of his office budget the Port Future Study, which in 2016 found the port might not outgrow its current site in 50 years, but that work should begin on identifying alternatives, in case it did. Before the 2017 elections New Zealand First advocated an early shift of the vehicle-import trade from Auckland to Northland’s port. The coalition government including New Zealand First took a bigger picture approach, setting up the Upper North Island Supply Chain Strategy working group, in line with a request from Auckland Council. New Zealand First MP and Regional Economic Development Minister Shane Jones who oversees the working group, has since been vocal on matters relating to the future of Auckland’s port. 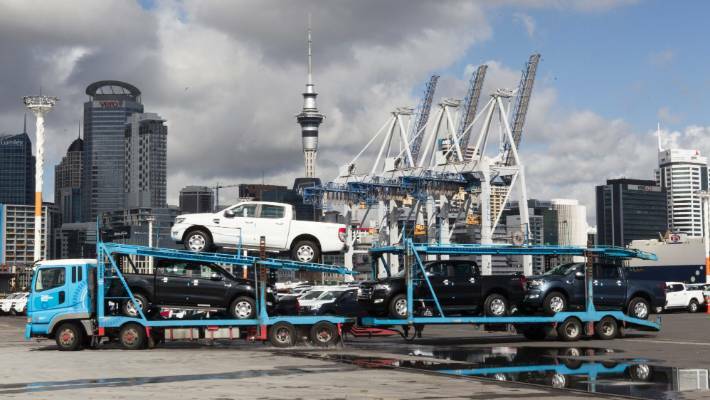 At the start of November Jones said he would do all he could to head-off a planned multi-storey carpark building planned by Ports of Auckland, to house vehicles arriving in the port. “Public statements have created the impression of pre-determination,” said the council in a letter to the chair of the working group Wayne Brown. Brown has made public comment favouring a move to Northland, including an opinion column published in November 2017 before being appointed to chair the group. “Imagine the Auckland waterfront without used cars getting the best views,” Brown wrote. The council’s letter pointed to comments by Brown. “Indicating a strong preference for relocation of some or all of POAL activities to Northport prior to any analysis is unhelpful,” said the letter which Goff will sign. 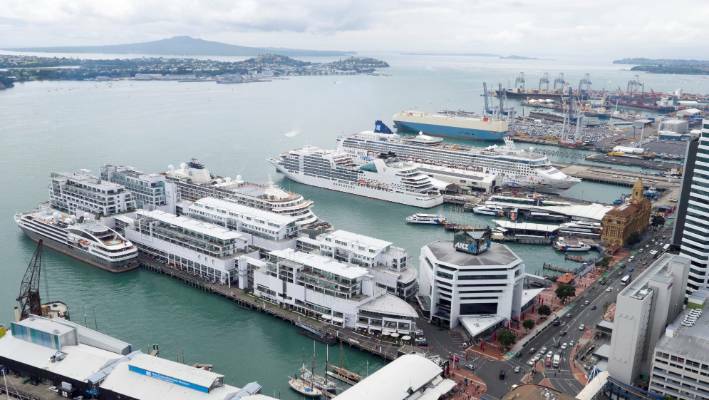 “Any plans to move all or some of the Port’s functions requires the concurrence of its owners, the people of Auckland, through Auckland Council,” said the letter. “I’ve already said to the chair, we’ve put a lot of work into two future options (Manukau Harbour and Firth of Thames) and you’ve dismissed this out of hand, which gives us no confidence,” Goff told today’s planning committee meeting. The council has spelled out 10 areas it wants the working group to examine closely. These include the feasible capacity of all upper North Island ports, as well as the climate change impacts of moving freight to and from the ports. It wanted work done on the social and community impacts of any change, and how and when a future new port would be funded. The council will have its first meeting with the government’s working group on December 13. 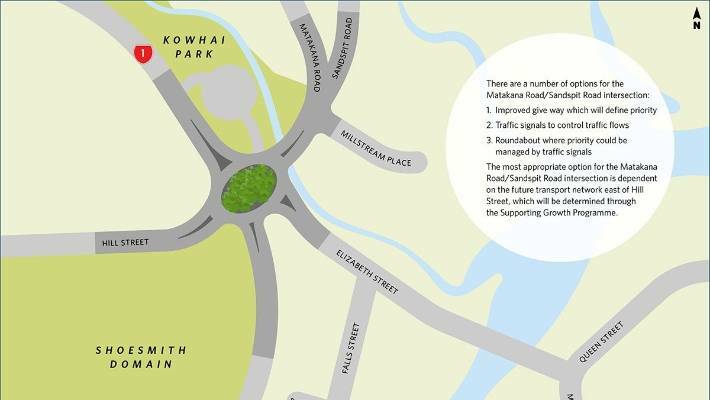 Residents are unimpressed with a government agency’s top three options for fixing an infamous north Auckland intersection. 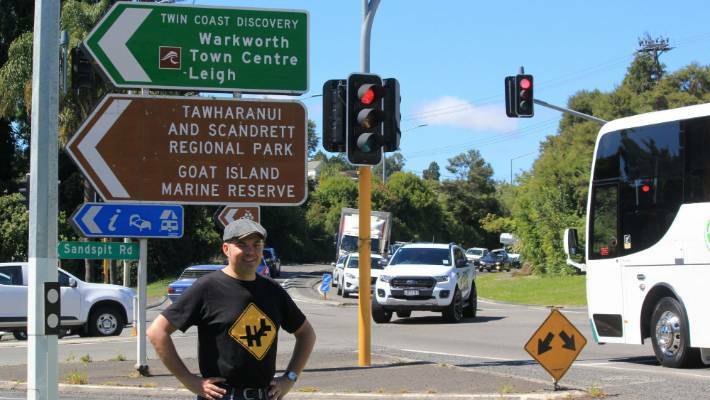 Warkworth’s Hill Street intersection is one of the country’s worst and the community has been begging the New Zealand Transport Agency (NZTA) for a permanent fix for years. The NZTA has now shortlisted three options for fixing the intersection, which has a reputation for creating driver confusion with its 55 different turning combinations. 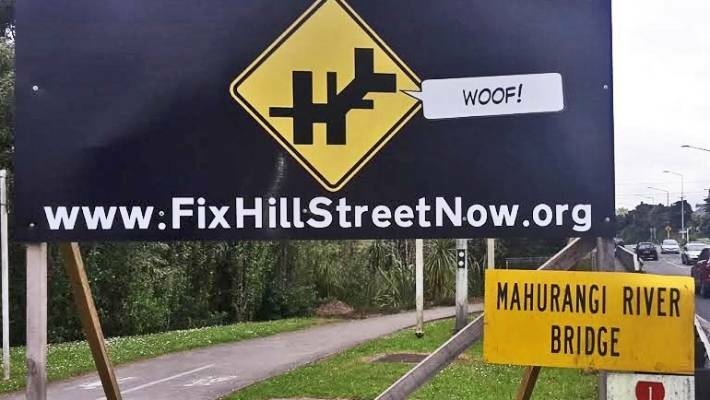 The Fix Hill Street Now action group’s billboard raises awareness around the Warkworth intersection. 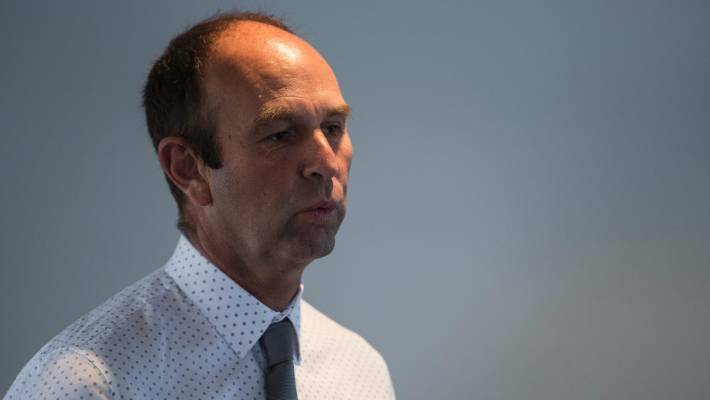 In a statement, NZTA director of regional relationships Steve Mutton said the focus was to simplify traffic movements, improve congestion and cater for future traffic growth. Two other nearby roading projects, one linking to Matakana and another major motorway upgrade north of Pūhoi, opening late in 2021, would also reduce traffic through Hill St.
NZTA director of regional relationships Steve Mutton said the options were designed to eliminate confusion, improve congestion and cater for growth in the area. “There may be a need to phase the improvements at the Hill St intersection to align with these projects, and when future development is completed,” Mutton said. Residents feel so strongly they have set up an action group, dubbed “Fix Hill St Now”, going so far as printing t-shirts showing there are five intersections in 30 metres. “FIx Hill St Now” campaign leader Grant McLachlan is not entirely happy with any of NZTA’s three options. Option A featured a large roundabout on the highway with five exits. McLachlan was concerned the roundabout entry points were too close together, posing difficulty for buses, trucks and trucks with trailers. St and SH1 intersection. 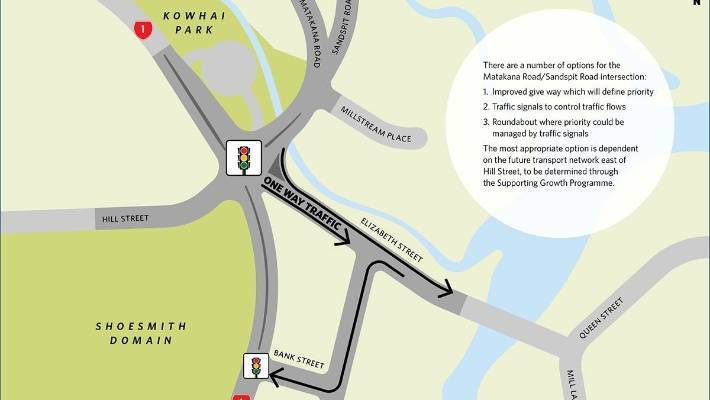 Elizabeth St would become a one-way street leading into the Warkworth town centre and a new connection at Bank St would serve as a route back on to SH1. McLachlan said this and option A both failed to deal with a problem at another nearby intersection where traffic often backed up on the busy roads leading to Matakana and Sandspit. He was also concerned about a new signalled intersection on the highway leading into Warkworth, saying traffic would back up and could cause problems for the police station and a St John ambulance terminal. 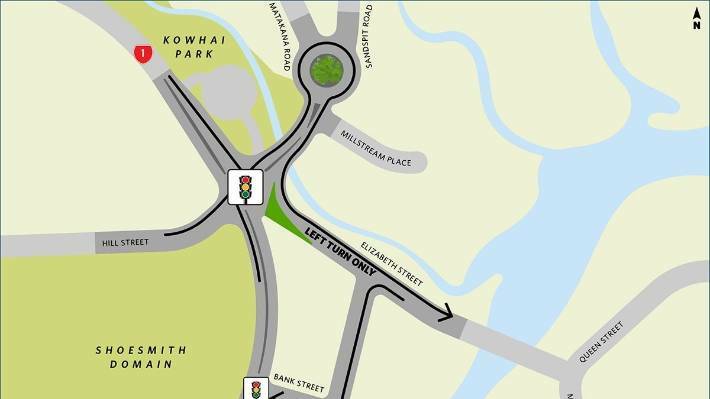 Option A included a roundabout with exits to SH1, Hill St and Elizabeth St.
A variation of option B included a roundabout at Matakana and Sandspit Rds and made Elizabeth St available for left-turning traffic from Hill St only. McLachlan said the group was disappointed in the three short-listed options. Option B involved traffic lights at the Hill St and SH1 intersection and at a new connection from Bank St to SH1. When asked if the Hill St intersection garnered more collisions than other Warkworth intersections, Brendan Reid of Warkworth Collision Repairs said he “couldn’t say that was the case”. A variation of option B went on to include a roundabout where Matakana and Sandspit Rds split. He believed the traffic lights and reduced speed caused by confusion made the chance of accidents less likely. Auckland Council Rodney councillor Greg Sayers said the announcement of the three shortlisted options was the beginning of what the community had been wanting desperately for many years. The agency was seeking feedback from the public on the shortlisted options. Feedback could be submitted online or at the Warkworth Library by December 14.